From award-winning author Melissa Stewart and Caldecott honoree Steve Jenkins comes a noisy nonfiction exploration of the many sounds animals make. Barks, grunts, squeals—animals make all kinds of sounds to communicate and express themselves. With a growling salamander and a whining porcupine, bellowing giraffes and laughing gorillas, this boisterous book is chock-full of fun and interesting facts and is sure to be a favorite of even the youngest animal enthusiasts. Melissa Stewart is the award-winning author of more than 150 science books for children. After earning a bachelor’s degree in biology from Union College in Schenectady, New York, and a master’s degree in science journalism from New York University, Melissa worked as a children’s book editor for nine years before becoming a full time writer in 2000. While gathering information for her books, she has explored tropical rain forests in Costa Rica, gone on safari in East Africa, and swum with sea lions in the Galapagos Islands. She lives in Acton, Massachusetts. *STARRED REVIEW* "Barks, grunts, squeals, whines, bellows, growls, and laughs—all kinds of animals use all kinds of sounds to communicate.This collection of animal vocalizations will delight readers and listeners. Prolific science writer Stewart always chooses appealing facts, but what makes this collection work so well is the skillful presentation by both author and illustrator. There's a question: "Can an aardvark bark?" And an answer: "No, but it can grunt." A short paragraph tells when and why it makes that sound. The next spread reveals some different grunting species and what their grunts might mean. The next two spreads introduce barks and squeals. Just when listeners or readers begin to see a pattern of question and answer, it's disrupted: "Can a porcupine whine? Why yes, it can!" The surprise adds just enough tension to keep the audience going through growls, bellows, and laughs. A final page asks listeners and readers if they can make the same noises. Jenkins' characteristic cut-and-torn-paper collages are a perfect accompaniment. These sharp-edged, accurate images, set on plain white backgrounds, show beautifully. The highlighted animals—aardvark, New Zealand fur seal, wild boar, porcupine, dingo, giraffe, and kangaroo—are shown on double-page spreads, each followed by four other, equally interesting species. The final page includes portraits, an invitation for identification. Don't share this engaging read-aloud in a quiet library." Using a question-and-answer format that employs internal rhymes, Stewart and Jenkins enlighten readers about animal utterances. “Can an aardvark bark? No, but it can grunt,” Stewart informs us. She follows up with a paragraph of supplementary aardvark facts and an additional spread itemizing other grunting animals. Most subsequent Q&As reference previous questions (“Can a seal squeal? No, but it can bark”), excepting the answer for porcupines, who can indeed whine. Jenkins’ signature cut-and-torn-papercollage illustrations seem to jump off the page. They are at once boldly simple (set against white backgrounds) and amazingly detailed (a result of the varied textures used). Multiple type sizes add to the book’s versatility. Toddlers will enjoy the large-print Q&As, while older children will appreciate the informative paragraphs presented in smaller font. And while there’s much to be gleaned about familiar and esoteric species (who knew a giraffe could bellow? ), the final spread, encouraging listeners to let loose their own laughs, grunts, bellows, and growls, provides the perfect excuse for toddler participation. Stewart, author of Feathers: Not Just for Flying (BCCB 3/14), partners here with the inimitable Steve Jenkins in an overview of animal sounds. Big print text provides some Q&A (“Can an aardvark bark? No, but it can grunt”) while smaller text gives more detail about the latter vocal behavior; a followup spread describes other animals that make that noise (“Lots of other animals grunt too”). The book tours through animals that bark, squeal, roar, growl, and more, cleverly looping each new question back to the previous one (with one inexplicable exception). The book wisely goes beyond mammals to explore the subject, and it clearly identifies when the sound in question isn’t oral (for instance, dolphins “make squealing calls by opening and closing the blowholes on top of their heads”). Jenkins’ familiar textured cut-paper collage work provides portraits of animals caught mid-cry, which is an unusual perspective on creatures less known for their chat, such as the capybara and the giraffe. The final spread invites audiences to try their own vocalizations, but it might be more entertaining (if chaotic) to encourage contributions along the way. End matter includes a list of selected sources and a few books for further reading; you’ll have to find YouTube links to sound samples on your own. Stewart (Feathers: Not Just for Flying) highlights the sounds that animals make in this inviting primer, which is augmented by Jenkins’s torn-paper portraits. Stewart leads with internally rhyming questions about particular animals (“Can a wild boar roar? No, but it can squeal”), and the subsequent pages introduce additional animals that make similar sounds; a European hedgehog and European spotted dolphins are among other creatures that squeal. Brief captions elaborate on the animals’ methods of communication: “A male koala really makes a racket at mating time. His deep, growling bellow helps females find him.” Jenkins (Squirrels Leap, Squirrels Sleep) renders each animal with characteristic attention to detail and subtle texture, resulting in a handsome and dynamic exploration of animal behavior. Students will be surprised to learn that though an aardvark can’t bark, it can grunt. Stewart opens every other spread with a query about what noise an animal might make (“Can a dingo bellow?... No, but it can growl.”). After answering, the author organizes groups of creatures that make similar sounds on the following spread, often with surprising results (platypuses will softly growl when disturbed). These groupings are fascinating for their diversity, and noises covered include greetings, sounds made out of fear or to attract food, and mating calls. Jenkins’s cut and torn paper illustrations provide not only texture but also an incredible amount of detail. For instance, students can almost count every quill on the African crested porcupine. Overall, the layout is smart, as animal names are in boldface and the communication style (growl, hiss, etc.) is in a larger font size, signaling its importance. VERDICT A terrific title for elementary-age kids to help them draw comparisons between animals and sounds—libraries can’t go wrong. From board books to scientific tomes, animal expressions have fascinated readers of all ages. In an ingenious twist on a familiar topic, Melissa Stewart--with more than 180 titles to her credit--cleverly disrupts the predictable cow/moo paradigm with the noises animals do not make. Let's start with the titular "Can an aardvark bark?" The answer? "No, but it can grunt," with additional information about the long-nosed insect-eater, which "grunts softly as it zigzags across African grasslands at night." Turn the page to reveal how "[l]ots of other animals grunt too," including river otters, hamadryas baboons and even an oyster toadfish, complete with added tidbits about these fellow grunters. The pattern quickly emerges: seals don't squeal and wild boars don't roar. But just in case readers become complacent, Stewart again surprises with the aural habits of a porcupine: Can it whine? "Why, yes, it can!" followed by a spread of whiners, including American martens. The original pattern returns, featuring dingos that don't bellow, giraffes that don't laugh, and kangaroos that don't mew. With so much excitement happening on the page, the final spread invites loud participation. Can an Aardvark Bark? marks Stewart's first-time collaboration with Steven Jenkins, who has created some three dozen titles, including Apex Predators. Dazzlingly set against a pristine white background, each of the diverse animals is represented with both accuracy and charm. Engaging the attention of the youngest readers is more important than ever; enriching books like Aardvark are ideal for encouraging future generations of advocates and protectors. Discover: Melissa Stewart and Steve Jenkins--award-winning, prolific creators--present an ingenious, playful twist on the predictable animal-noise theme with terrifically engaging results. 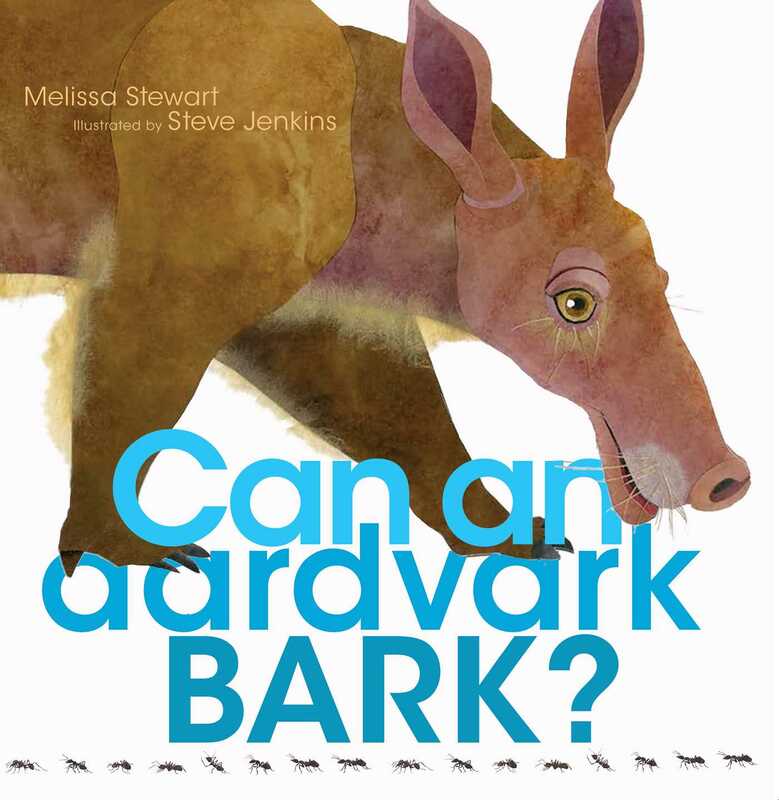 Book Cover Image (jpg): Can an Aardvark Bark?